The KitchenAid mixer has long been the kitchen tool of my dreams. My parents received this particular avocado-colored model as a wedding gift in 1969, and it has been a loyal servant in my mother’s kitchen ever since. 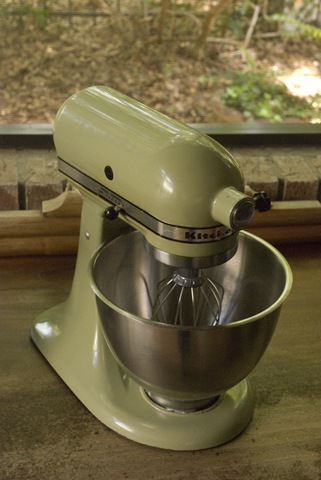 This mixer was the sturdy workhorse of my youth, a trusty companion in early baking endeavors – the high-speed beater made churning out my favorite cookies and quick breads a breeze. I can still feel the heft of the KitchenAid as I pull it out of the cabinet in my memory, and can still hear the motor purring and the beater clinking against the sides of the cavernous stainless steel bowl. I honestly thought I would have my own KitchenAid sooner, but living abroad has temporarily postponed my dream. Not that it’s impossible to have a KitchenAid mixer in Spain, but it’s more expensive and harder to come by than at home in the States. Nonetheless, I clearly envision this iconic American kitchen tool on my Spanish countertop in the future, ideally in a bright, sunny color. Enter the Thermomix (pronounced ter-mo-MEEKS’), the German-made, do-it-all kitchen machine, which appears to be the wedding gift equivalent of the KitchenAid here in Spain. 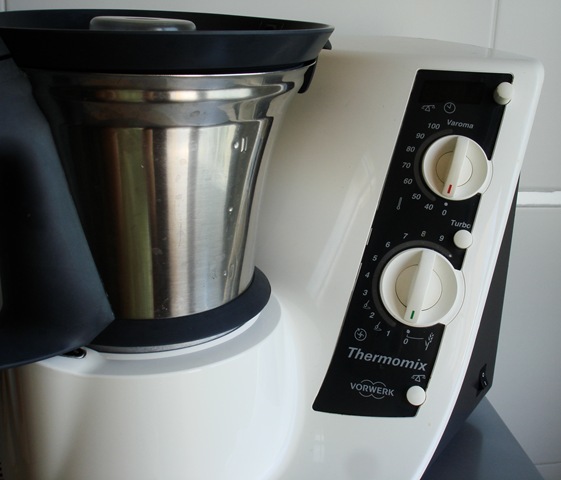 Thermomix sales function sort of like Mary Kay – individual representatives, typically women and often quite fervent, give demonstrations for groups in private homes and spread the word among family and friends. The number of converts continues to grow, in spite of the €800-or-so price tag. This is my kitchen, but it is not my Thermomix. It belongs to my friend Inma, who received it several years back as a housewarming gift from her mother-in-law, a common source for the machine. In the time I have been in Murcia, I have sampled many of Inma’s tasty Thermomix concoctions – rice pudding, gazpacho, salmorejo and lemon and strawberry sorbet, to name a few. She has been telling me for two years that I could borrow the Thermomix any time I wanted, and I finally took her up on the offer. I felt as though I was entering a cult as I opened the accompanying cookbook, “THERMOMIX – A New Dawn.” This would be an initiation into the modern Spanish kitchen, and a journey into an alternate kitchen tool dream. I was a bit skeptical at first, given the place the KitchenAid occupies in my heart – was I being disloyal? 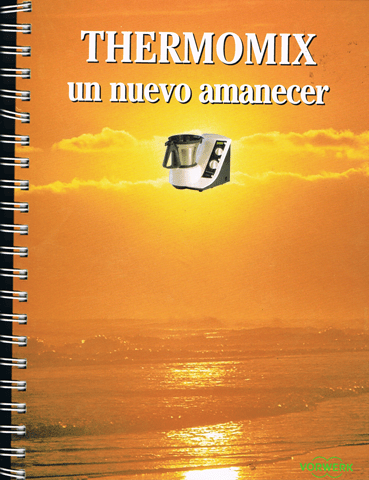 But the Thermomix is really a different beast – not so much a mixer as a super food processor, called a “robot” in Spanish. The Thermomix weighs, heats and whizzes foods into impossibly silky purees; it can keep time and knead yeasted doughs and incubate them while they rise. On the cold side, the Thermomix makes ice cream and velvety sorbets, perfect for hot summer days. Am I sounding like a convert yet? The truth is, the Thermomix makes cooking, particularly anything involving grinding, pureeing or whipping, effortless. Just roughly chop the ingredients, toss them all in and crank up the dial. One container to wash, no elbow grease involved, enticing results. Now the question is, will I have enough room for both machines on my counter? Stay tuned for a Thermomix salmorejo recipe. I´m in the same conundrum!!!! i grew up with my mom cooking incredible sweets and pizza dough in the kitchenaid…i always dreamed of having one… and here i am… thinking about the TMX… i really wonder if i could replicate my mom´s recepies in the TMX and keep on our family dishes… it´s really a drawback for me that you have to start using the TMX with the TMX books… what did you finally do?? haha I found your post through google, and found it funny that you think like me. I am an American living in Spain with friends who have the tmx, but I, myself, want the KitchenAid. Sigh. Maybe someday- one, or the other or both. Maybe one day we will both be lucky. Good luck!! Hi Tracy — I wonder how many of us there are out there? I’m thinking we should start a support group ;). I’m still in limbo… Good luck to you, too! I think you need both, and I will get both .Out of practicality I chose the Thernomix first, too. While it does almost everything, it still does’nt slice, roll pasta for you , properly juice, stuff sausages etc.And it doesn’t look half as attractive to what a Kitchenaid does.